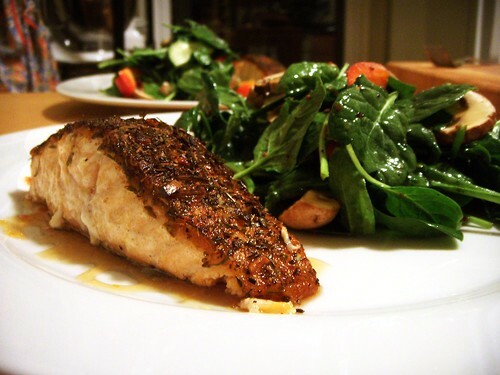 cajun crusted salmon on fresh garlic-chili sauce with spinach salad, originally uploaded by aarn! +10th October, 2008+. rubbed the fleshy side of a couple nice slabs of atlantic salmon in an earthy textured cajun seasoning, from christina's spice store in inman, until it was fully coated with a nice thick layer. placed the fillets face down in some really hot oil until nicely browned and a nice crust formed (just before burnt), then flipped the salmon over in the pan and put it in a 400-degree oven for about 12-minutes. once cooked the salmon was plated on top of a fresh sweet garlic and chili sauce made from a few seeded hot chili peppers ground up with a couple cloves of garlic and a nice chunk of peeled fresh ginger, which had been reduced to about 50% with a 1:1 ratio of light brown sugar over low heat, then placed in a squeeze bottle in the freezer to cool. the salad was baby spinach, tomatoes, cucumbers, porcini mushrooms, and dried cherries, with a dressing of olive oil, seasoned rice vinegar, honey, and a bit of large grained mustard.